Hey, friends! I’m definitely late on this update because Anthony turned 15 months on Sunday (how?! ), but I wanted to have his entire first year on my blog. Plus, who doesn’t love an excuse for adorable baby photos? At the end of this post, I’m including some fun facts about Anthony right now. The last three months of Anthony’s first year were so much fun. We got to do many new things with Anthony on our four-week trip to Washington DC, and I loved watching him explore. At his 12-month appointment, Anthony was 21.4 pounds (55th percentile) and 30.75 inches (80th percentile). 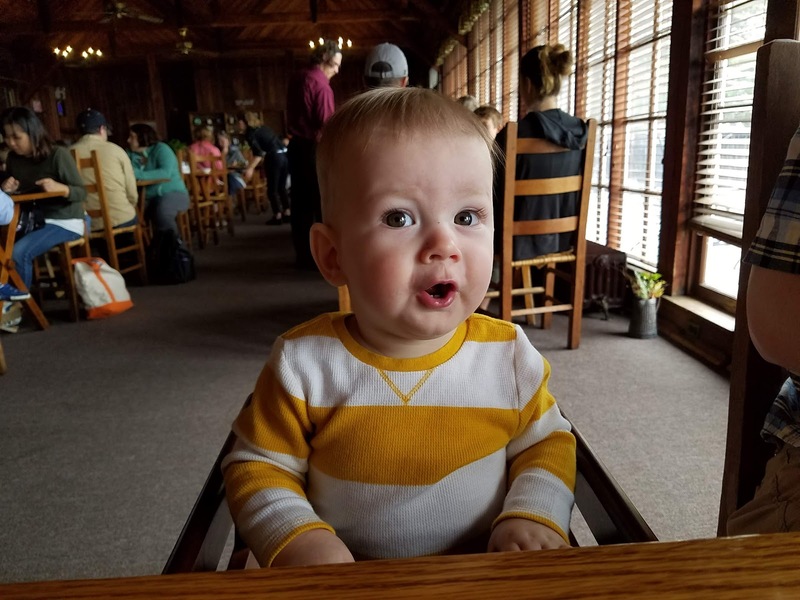 He’s come a long way from being in the second percentile for his weight at his two-month appointment! 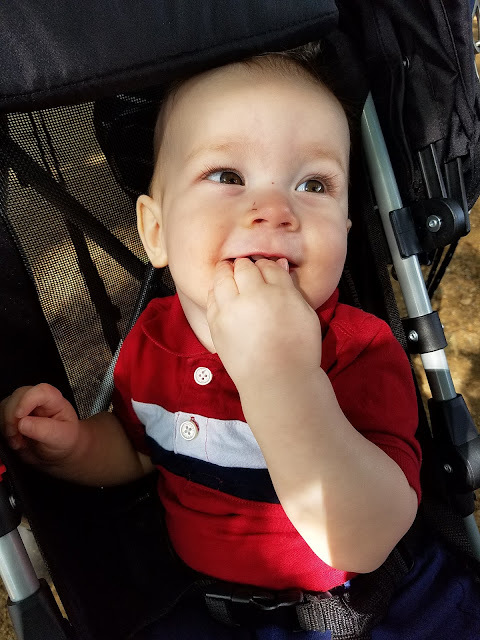 Around his first birthday, he had eight teeth. Those last three months before one were full of milestones. The biggest milestone was walking. He was taking a few steps here and there at 11 months, but he didn’t consistently pick walking over crawling until 13 months. His other big milestone was his language. I had heard that children who learn two languages at once can be slightly delayed with their language, but Anthony has been doing well so far. The first word he said (and understood the meaning) was bye-bye. He always says it when we leave a room or go through any door (and he waves! It’s so cute). At his one year birthday, he knew eight words: buh-bye, dada, baba (for my mom), go, mmm good, ky-ky (Russian for peek-a-boo), kaka (Russian for dog), and ball. Since then, he’s added on quite a few more words. My favorites from his new words are mama (he finally said it consistently right after Christmas! ), teeth, cheese, and bubbles. Anthony had so many fun firsts in months 10-12. On September 8 (at 10 months), he had his first flight. He did so well. For those of you with babies and toddlers who haven’t flown with them yet, the biggest recommendation I can give is to buy them their own seat. It is so much easier and much safer, too! 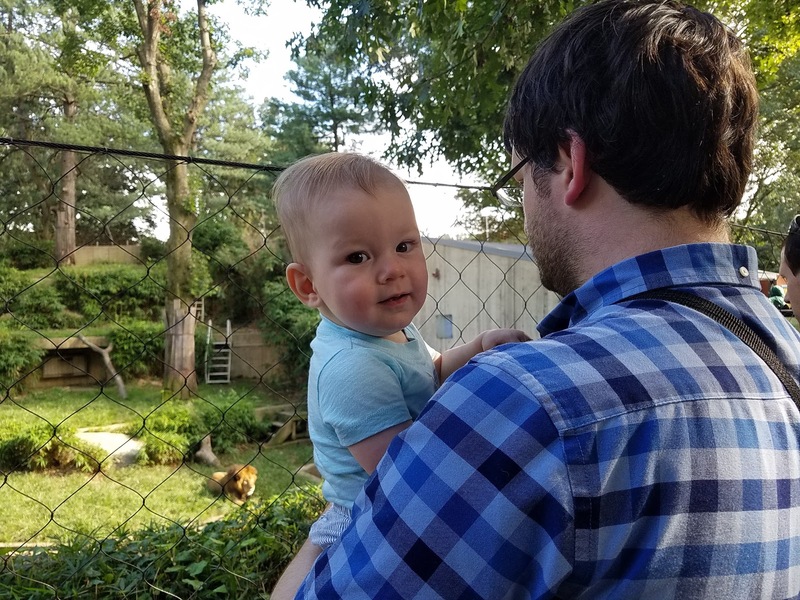 We took him to the ocean for the first time at Assateague Island, and he went to the zoo for the first time at the Smithsonian Zoo. We also visited monuments, Monticello, Shenandoah National Park, and took Anthony to his first apple orchard. We added three new states to Anthony’s state list while in DC, so by the time he turned one, he had visited five states. On our flight back, he really was a super trooper because we got stuck on the plane when we landed due to a thunderstorm, and we didn’t get home until 11 p.m. We also experienced 30 seconds of the worst turbulence I’ve ever experienced as we flew through the thunderstorm. Like I mentioned in my last Anthony update, I was beyond excited when he turned the corner with his nighttime sleeping. For a while, Anthony was wanting to do all of his sleeping at night. He would go to bed at 8 p.m., wake up at 6:30 a.m. to feed, and then he would want to go back to sleep until 9 a.m. It was really nice because I could get some work done in the morning. As a result of his night sleep, he would only take two 30-minute naps during the day. This changed again recently, and now he’s sleeping 11 hours at night (he does wake up once occasionally), taking an hour and a half morning nap and a 45-minute evening nap. Anthony still loves to eat! We made it to one year of breastfeeding (and we’re actually still breastfeeding, which is crazy to me. I doubted I would make it to a year, let alone longer than a year). He never really used bottles, so it was easy to transition to a sippy cup. He will pretty much eat everything. His favorite food includes eggs, cheese, tortillas (or any kind of bread), zucchini, squash, salmon, bananas, and strawberries. The only food we have noticed he doesn’t like so far is carrots. He’s also not a big meat eater yet. His Dada likes to say Anthony somehow manages to eat as much food as he does. Anthony loves people (he is shy for about 10 minutes when he meets someone new, but then he won’t stop talking! ), going to the park (swinging and going down the slide is his favorite), dancing (any time I say “dance, dance,” he starts dancing! ), listening to music (Baby Shark is a favorite, of course), and reading books. He is also a huge fan of our dog Skyler and is always looking to see where she is. She is finally a big fan of his, now that he throws her food from his high chair. His favorite toys at that age were a dump truck (he loves to drive it around), his V-Tech Activity Walker, and any kinds of balls to kick and throw. Really, the only big dislike at that stage was diaper changes. They got really difficult, and it was hard to keep him distracted. Around ten months, Anthony learned how to give hugs! If you ask for a hug, he will cuddle in close, and it’s the sweetest thing. Around the 12-month mark, he really got interested in Baby Shark. He calls it “Doo, Doo, Doo,” and he knows I say “Alexa, play Baby Shark” to get it to play. He tries to get Alexa to play it by saying, “A, A, Doo, Doo, Doo!” Then, as soon as the song starts, he starts to dance. He knows the last line too and starts saying “Doo, Doo, Doo,” so I’ll play it again. He hands me my phone and asks me to see photos of himself. He calls himself “Tota” because his Russian nickname is Tosha. He recently started wagging his finger and saying “no, no, no!” I think he saw us say that to Skyler. If he can’t see me at church or while we’re shopping as a family, he’ll call for me. We bought him a Pottery Barn Anywhere Chair, and his favorite thing to do with it is roll it over and unzip it. He is constantly waving at people and dogs.